Chuck Norris -- I Didn't Green Light the Weed! Chuck Norris just got smoked -- by a bunch of people who purchased a brand new strain of weed offered in L.A. pot shops that's named after the icon. Just one problem -- Chuck never signed off on it. 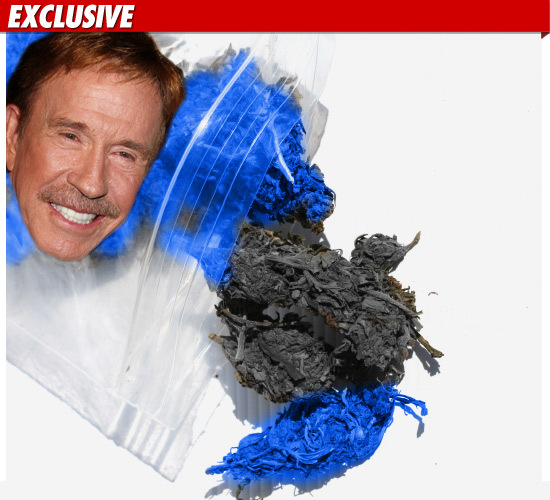 TMZ has learned ... the strain is being sold under the name, “Chuck Norris’ Black and Blue Dream" -- apparently because it has a "real kick to it" .... ha. A rep for Chuck assures us, "This is definitely not an authorized use of his name" -- but it's unclear if Norris will spring into action to do anything about it. Besides, Chuck Norris doesn't get high ... he makes everyone else low.